You may be a good athlete, but sometimes you are just in a bad mood and do not want to take part in any physical activity. Or, you may be looking to spend some time with kids and family but do not know how to get out of work. A simple way to accomplish these tasks is to learn how to pretend you have an injury. As a common injury, a sprained ankle is somewhat easier to fake. You usually sustain this type of an injury because of a fall. Depending on the severity, it can take 2-8 weeks to recover completely. To fake it, you can say you have sprained your ankle while walking down a steep hill. You will have to wear a fabric bandage such as an Ace bandage. If someone makes you see a doctor, just be sure to portray mild pain and some difficulties moving your foot. Do not exaggerate, or they may order tests. It is a relatively safer choice, especially when you know that you will be asked to take tests. Shin splints – an injury to your shin – usually does not show up on X-rays and scans, which is why you can always fake shin splints to take some time off from your regular activities. It takes a few weeks to heal. You can say that you sustained an injury while you were running to help lose some weight. When forced to see a doctor, you can say that you had some swelling earlier but now it seems better. You can also say that your leg seems to swell at night. How to fake an injury of rotator cuff? Rotator cuff is actually a combination of muscles in your shoulder. You can get it strained when applying too much force overhead. It takes about 2-6 weeks to heal completely. You can say that you have sprained your rotator cuff when you used your arm to keep you from falling down the stairs. Do not make it too serious though because serious cases require injected steroids or even surgery. It is not easy to make others believe that you have this injury, especially when there are tests available to confirm your condition. Therefore, the best thing is to downplay it as mild or moderate to your doctor. This will keep them from investigating it further. You can say that you sustained this injury while lifting a heavy box. Your doctor may ask you to wear a back brace and suggest bed rest for up to a month. The ACL is a ligament in the knee and it can get injured due to strain and exercise. Again, there are certain tests to confirm if there is a sprain or other types of ACL injury. Therefore, you should make it look mild only to avoid taking the tests. While faking it, you can say that you sustained the injury while jumping from a high spot and landing badly. An Ace bandage is usually required but crutches may or may not be needed. Learning how to fake an injury requires some information about different injuries and some preparation as well, especially if you decide to fake a head injury. Be sure to put an ice pack in your locker. If you want to skip a class, pretend to fall and hit your head gently on a wall or desk. Be sure to grimace in pain and cry if you do not mind. Then, go to your locker and apply the ice pack to your head. Even if you have to go to the class, you can tell your teacher how painful the injury is. Be sure to talk slowly and react to loud noises to show that you are in real pain. "While doing gymnastics, simply jump and land in an awkward way. Grab your foot and start screaming. Ask someone to help you go to the doctor. You will require some serious acting skills to make your doctor believe that you are indeed in pain. Depending on your acting, your doctor would diagnose it as a bruise or sprain and suggest you to take a break from all your activities for a week or so. I did the same and it worked great for me – it helped me get out of volleyball in gym and homework." "How to fake an injury? 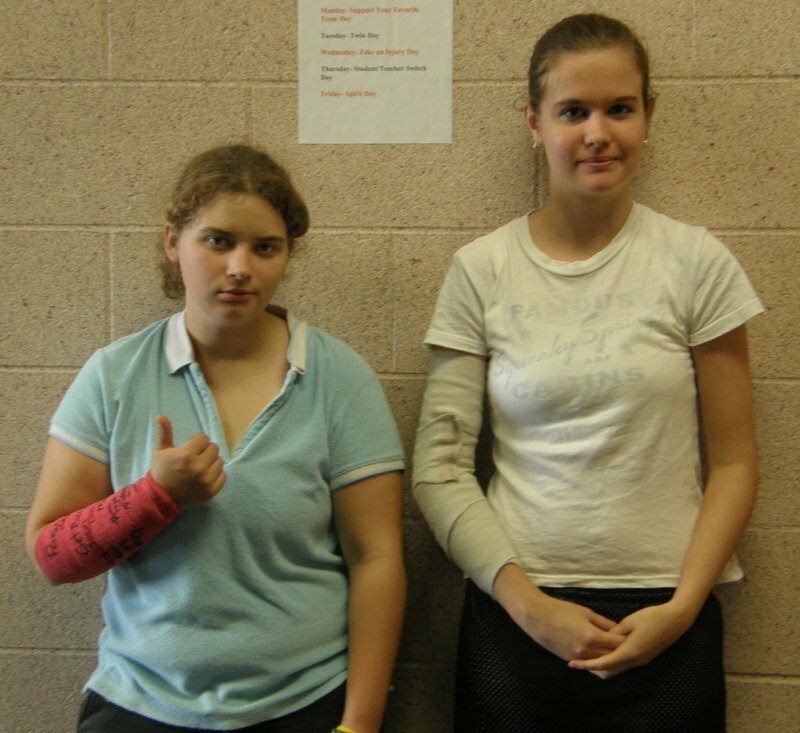 I think it is always a good idea to say that you have broken your arm. You can even use a fake cast. Alternatively, you can say your leg is broken and need crutches. You can always say you hurt yourself while doing a challenging flip. You can also say that you have injured your leg while racing. Once you get a cast, it is likely to stay for 3-6 weeks." "I wanted to skip classes and decided to fake an injury. I used an elasticated bandage and put it over the length of my arm. I cut a bit of the bandage to ensure that my thumb would go through. The excuse I used was, I was climbing up a tree but slipped. On my way down, I had my arm stuck. I went to the doctor and they say I have pulled a muscle and need rest."